This report explores the impact of improved billing on project-based businesses including professional services, consulting engineers, industrial consultants, environmental consultants, electrical engineers, civil and structural engineers, energy consultants and fire consultants. Please note that you can download the PDF of this white paper. 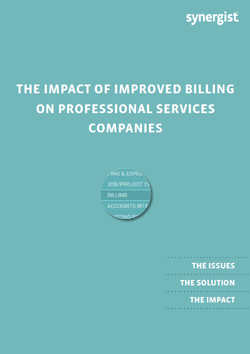 Summarise the risks and opportunities for companies regarding their billing processes. Explain some – perhaps surprising – things to look out for when selecting a new system. Show how businesses are reaping the rewards with the right approach by using a new system as an opportunity to lift profitability. If your system easily introduces errors, you have to invest time for error-checking. This is obviously unproductive time. Worse, time is robbed from a team trying to get on with their work but being interrupted by questions about billing. These interruptions are usually at month-end when invoice delays are particularly costly, deadlines loom and stress levels are high. If your billing process makes it hard or confusing to enter time and costs, and doesn’t intelligently pre-empt mistakes, costly errors will always creep in. For example, costs can get logged to the wrong project or billable work can be omitted from the system and therefore overlooked at billing time. If the client is surprised by an item in an invoice, no matter how minor the apparent discrepancy happens to be, it serves as a reason for them to delay payment. If your quotes system is also inefficient and error-prone, it can only bode ill for the invoicing that stems later from it. 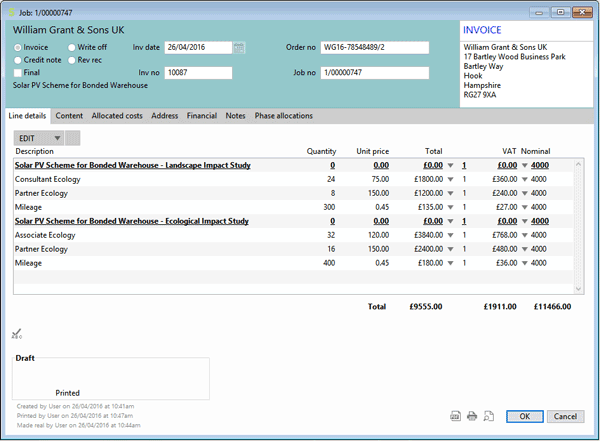 Items should be entered once and accumulated during the quotation and project delivery stages until the point that billing is reached, at which time creating an accurate invoice incorporating all chargeable items should be a simple process. Invoicing can be hazardous. Are there many other activities in your company’s entire list of processes that could deliver such a catastrophic effect on cash flow if you get it wrong? Luckily, invoicing is also one of those processes that technology can deliver huge benefits to when you get it right. Late billing has multiple negative effects. The first is that the clock for debt collecting can’t start ticking until the invoice is served, so the later you bill the later you get paid. Secondly, clients have selective memories. If you bill late, other priorities emerge for them. Their perception of the value of work you did for them diminishes week by week. Statistics show that the later the invoice is sent, the greater the likelihood of it not being paid at all. Even small delays can have a big impact. Large companies pay on fixed cycles, so if you miss one by even a day you may have to wait a month. Many companies have a divisive team perception problem yet don’t realise it. 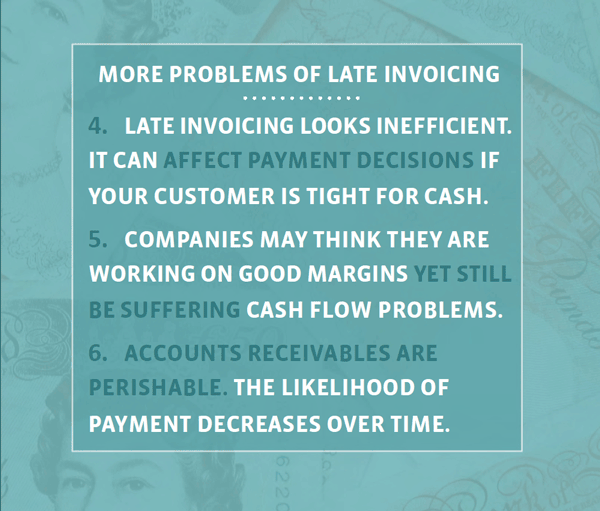 Invoicing can be seen as the ‘accounts department’s problem’. ‘Something that the finance people sort out. It’s their job’. This is a common condition. But it leads to friction, delays, mistakes, client frustrations and poor decisions by team members. Surprisingly, these problems might seem hard to solve quickly, but they can be hugely helped almost overnight by simply introducing a system that reveals the commercial implications of each decision to the team. It’s one of the big payoffs of a good system. If your system doesn’t make it easy for the team to see where each job is at, you can hardly blame them for not seeing the big picture either. Only live visibility can solve this. Finance and non-finance people have different goals, pressures and even vocabularies. In the absence of a coherent system to pull everything together, terminology can be a major communication issue. If your company doesn’t have smooth integration between project, billing and your accounts system you are creating unnecessary problems – duplicated effort, potential for errors, delays, synchronisation issues between project and financials, inconsistent reporting, and risk. A good billing system needs to maximise the opportunity that billing presents, whilst making it a quick and easy process so users don’t try to put it off. Synergist can prompt you to raise invoices via email alerts or by a regular scheduled report of all projects needing billing for which you’re responsible. Add billing details to the project as they are agreed, in the form of a billing plan. Changes in the dates of a project or overall value are automatically reflected in the billing plan, ensuring accurate forecasting of billing. Work In Progress reports show all unbilled costs and, optionally, the age of them, acting as a great catch-all for costs that could otherwise go unbilled. 1. Project-specific content that would normally be added by the person running the project. In addition Synergist will prompt you with the correct currency to use, as well as the invoicing address and contact details to help ensure accuracy whilst making the process as easy as possible. 2. Accounting information including VAT rates and Nominal codes. This information is added automatically by Synergist as determined by the configuration of the system, but is usually checked by an accounts person as part of the process of converting the draft invoices (created by the projects staff in 1. above) into approved invoices ready for sending. This split of the invoice creation process ensures there is no hold-up due to the project person not knowing which VAT rate or Nominal Code to use, whilst still ensuring accuracy of the invoices sent out. What format of invoices can I send? 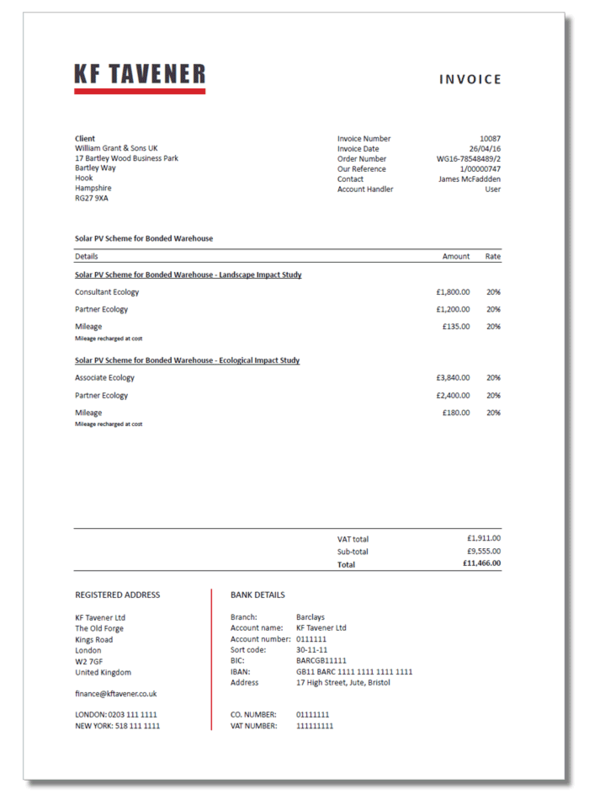 Synergist has a powerful layout tool that creates beautiful branded invoices that enhance customers perception of your business. Creating timely, accurate invoices that maximise the revenue opportunity that billing represents is only part of the role of a great billing system. In addition Synergist will post the details of invoicies sent into your chosen accounts system accurately and with minimal work. The accounts system experts at Synergist have created interfaces to over 15 leading accounts packages to electronically post details of all invoices into your accounts system whether it’s in your office or in the cloud. Invoicing is a continual ongoing process within the business, and all invoices sent are stored in a pending area awaiting transfer to your accounts package. You can then post the batch to your accounts system which will validate the transactions and provide either a confirmation of acceptance or a report of any issues. If required, Synergist has an interface to allow the batch to be edited and re-posted to correct issues such as incorrect nominal codes etc. With which accounts packages does Synergist Integrate? What's the effect on project-based businesses when they use Synergist’s invoicing process? 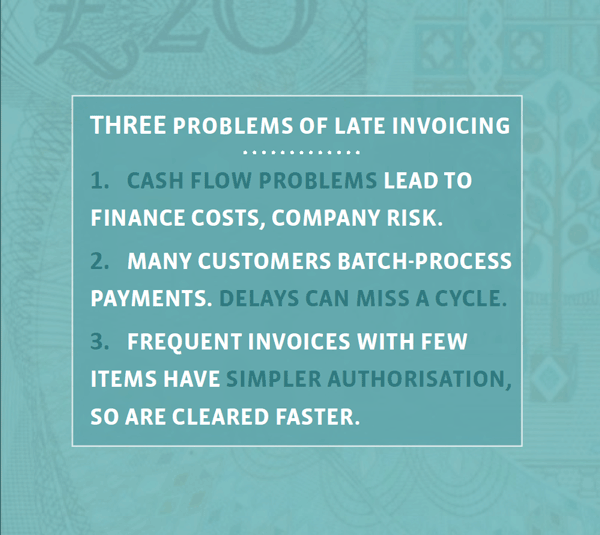 Here are the three biggest invoicing-related effects that our users tell us about. Business have any number of motivations for getting a new system, but improving profitability is usually high on the list. Typically such companies see their teams working hard every month but there is little to show for it. This clearly makes it hard for the business to grow. “Profitability was quite elusive. Everyone was working hard, but profits were hard to materialise. “The system has improved our processes. Solving the profitability problem was key. Cash flow is also usually high on most companies’ wish-lists. Late billing was a particular concern of another company that now uses Synergist. Rebecca Frain, Managing Director of Electrical Safety UK, a small consultancy, told us of their previous methods of producing invoices. They held the company back. “Billing was often late. When part of a project was completed it took time and effort to pull together all the costs and times and check for accuracy." 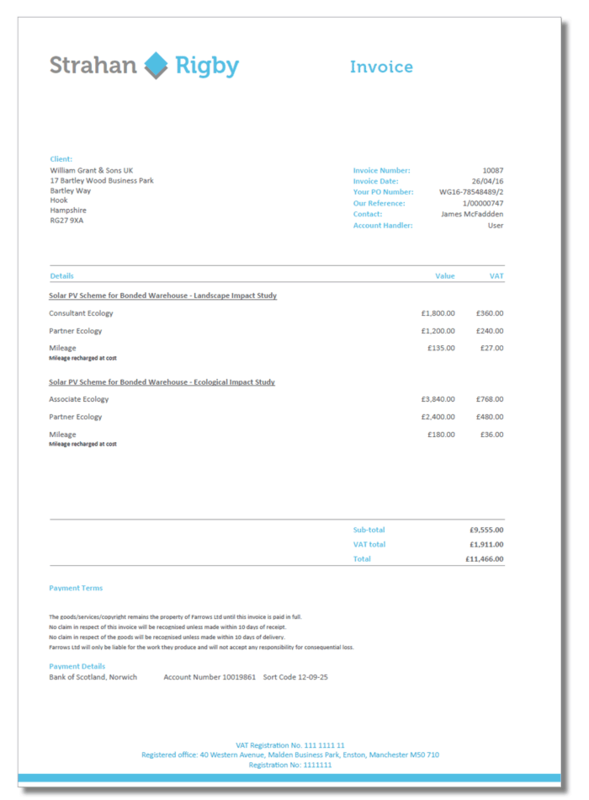 Talking of invoices, Synergist also handles their incoming invoices. How much time do the people in your company waste trying to find information every week? Nobody tracks it, but that doesn’t mean it’s not significant. Getting an integrated system with easy access to live and historical data can be an eye-opener. Webb Yates Engineers is a 30-person structural and civil design practice with offices in London and Birmingham. Andy Yates is a Director there. “We had a previous system which had been designed for architects and engineers but it had severe limitations. “It’s very useful to be able to immediately see things like: Invoice analysis.